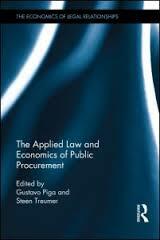 This book explores Public Procurement novelties and challenges in an interdisciplinary way. The process whereby the public sector awards contracts to companies for the supply of works, goods or services is a powerful instrument to ensure the achievement of new public goals as well as an efficient use of public funds. This book brings together the papers that have been presented during the « First Symposium on Public Procurement », a conference held in Rome last summer and to be repeated again yearly. Set-asides for small and medium firms, as in the USA system with the Small Business Act that reserves shares of tenders to SMEs only.